1926 Replica Little Happy Teddy Bear by Steiff. This hand made piece, in brown tipped mohair, wears the white ear tag, together with the famous patinated steel underscored Button in Ear. Limited edition of only 926 pieces worldwide. Ashby Bears proudly presents TEDDY BEAR "LITTLE HAPPY" REPLICA 1926 New or over ninety? You are not so sure when take your first glimpse of our Replica “Little Happy” Teddy bear from 1926. 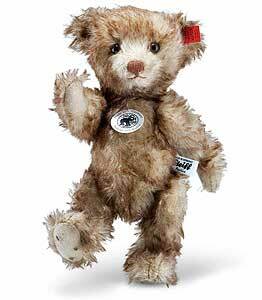 Because our Steiff designers have excelled in capturing every magical characteristic of the original. Even his stuffing is excelsior, like the original. His authentic look continues with his glass eyes and loosely jointed head. He even wears a period correct ear tag with ‘underscored button’ made of patinated steel. But be assured “Little Happy” is new, despite the worn out pads and bald spots. Just take a look at the impeccable yarn of recently embroidered nose and the white Replica tag attached to his side. But we all grow old, and “Little Happy” will gladly grow old with you by your side.